This training is suitable for; people working in care settings, health professionals, volunteers and exercise professionals (further pre-requisites may exist). Within the context of a falls prevention continuum the aim of CBE is to progress to standing work where able because chair-based exercise does not prevent falls. The evidence based exercises of this programme allow for progression to standing work whilst still providing a programme to maintain movement and strength for those requiring to remain seated. The CBE course has been in existence since 1999 but was significantly updated in 2012 as a result of the CMO Guidelines 2011. The updates were required to meet the current client and economic needs of community settings where the client base/service user is no longer only older participants or only disabled participants but instead integrated groups of older and disabled groups of older and disabled adults of all ages. The course examines the importance of evidence-based education and training for the health and social care workforce, volunteers and exercise professionals* i.e. it crosses and has application across three sectors. For this reason the course has been appropriately designed to meet the training needs and skill sets of a range of learner and the pre-set nature of this programme ensures exercises are suitable for this population. *Exercise instructors aligned with the REPs exercise training framework will be required to hold the L3 Older adult qualification prior to completing this training course and will only be eligible for associated CPD points if pre-requisites are met. Age related changes in bones, joints, the cardio-respiratory system and nervous system are studied interactively with an emphasis on their effect on physical activity and function. The implications of some specific conditions associated with ageing and disability for everyday functional movement and exercise are explored from a practical solutions point of view. Learners are trained to adapt the LLT CBE exercises (22 in total) for a wider range of functional impairments using a functional model approach with a range of supporting resources. All learners will gain skills to lead this pre-set programme of 22 chair based exercises, including sit to stand exercises. Particular emphasis is placed on exercise technique, safety and purpose, essential for supporting motivation, individual difference and longer term engagement in the programme. Learners will have supervised opportunities to develop and practice necessary leadership skills, group management and motivation. Learners are not required to design or develop their own exercises but inline with the learning level of this training, they are expected to deliver precisely and competently the preset, research-tried-and-tested, exercises. Evidence theory and practice is covered at an appropriate level and in line with CMO 2011. The 2012 revision better prepares older people to undertake the next step (i.e standing balance work) such as Otago strength and balance. Standing balance work is known to be the only way to effectively reduce future falls risk. The ‘Sit Tall, Stand strong’ CBE exercises allow leaders and managers to be confident that they are not only delivering a fun intervention that will improve participants quality of life, but also are helping their participants to meet the CMO’s recommended level and type of physical activities, reduce sedentary behavior all contributing to good mental health and well-being. The standard CBE runs over 4 full days with the assessment on the fourth day. The intensive CBE course is for appropriately qualified exercise instructors (if member of REPs pre-requisites apply), exercise and sports scientists, physiotherapists, occupational therapists and runs over 2 full days with the assessment on the second day. Days run from 9am to 530pm, full attendance is required. All learners will receive the two part CBE manual containing underpinning theory, practical guidance and the LLT evidence-based, practical exercises. A resistance band is also provided for use on the course and home practice. All successful learners achieving required assessed elements will receive an LLT Certificate in leading the Sit Tall, Stand Strong Programme. 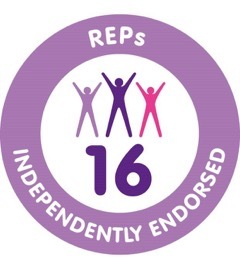 For appropriately qualified exercise professional’s 16 REPS CPD points may be applicable*. *Exercise instructors aligned with the REPs exercise training framework will be required to hold the L3 Older adult qualification prior to completing this training course and will only be eligible for associated CPD points if pre-requisites are met. All instructors are requested to check they have adequate insurance to lead exercise to this population. On successful completion of the assessment and after ensuring appropriate insurance for the setting, Qualified Chair-Based Exercise Leaders will be able to set up and run sessions in a wide variety of community care and recreational settings including sheltered housing, residential and nursing homes, leisure centres, health clubs, community halls etc. All sessions delivered should be subject to appropriate insurance cover. Download a CBE Flyer here. The CBE course was designed based on research by Skelton et al. and others, in 1999, with funding from the Department of Health. The original development team consisted of Dawn Skelton, Susie Dinan, Bob Laventure and a large advisory group. For further information, read the history. LLT’s CBE is effective! : The Evidence. Chair-based exercise has been shown to be effective in maintaining or promoting independence and mobility in older people. 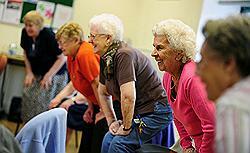 The evidence behind strength, flexibility and stamina work in a chair for frailer older people is strong. It is also cost effective. To read a review of the published research papers on the beneficial functional and quality of life improvements following chair-based exercise in frailer older people click here. You can also review the evidenced based papers and overview the course resources in the Resources section here. However, chair-based exercise is only the first step. While it improves several important aspects of physical fitness (upper and lower limb strength) it will not improve standing balance sufficiently to reduce falls risk. To get this crucial added benefit, participants must be progressed to standing dynamic balance and strengthening exercises. Restoring dynamic balance and strength not only reduces falls risk but also improves confidence and skill in performing everyday activities and increases independence. The gains made with the chair-based exercises make standing exercise possible. A recent Chair CPD Day (Poster Advertising Example) run by LLT for Active Hastings received a very favourable evaluation from the candidates. If you are a qualified exercise professional – your professional training is aligned with the exercise training framework (PD:Approval/REPS). If you are a member of REPS and hold the required pre-requisites (L3 Older Adult), this course receives 16 CPD points. REPS registered exercise professionals are advised that without the pre-requisites set out by REPS, insurance may be invalid. If you are a health professional or work within health and adult social care settings – your training is aligned with Skills for Health or Skills for Care so any REPs points/endorsement associated with this CBE training will not be valid (as entry level qualifications to enter onto the exercise register have not been achieved). All learners will be required to produce a full session plan using the 22 prescribed chair-based and chair-supported standing exercises covered on the course. Learners will complete a self-evaluation after their practical delivery. There are three worksheets to complete as homework during your course. Learners will have the opportunity to re-submit a worksheet to be remarked should any answers be incomplete/incorrect. All these assessment requirements will be thoroughly detailed on the course and in the several practice sessions included each day. A specific assessment date is assigned to each course; however, if this is not possible, arrangements can be made for candidates to be assessed on another course, although it must be appreciated that this may involve some travel. Once an assessment date is confirmed by the learner’s signature on Day 3 of the course, the assessment is non-transferable and failure to take the assessment on the due dates will incur a deferral fee. Re-sit fees following referral, are also applicable. Please download the CBE Terms and conditions. If you wish to make an appeal against your assessment decision, please complete the form contained within our LLT Appeals Procedure. The full 4 day course costs £410 + VAT and includes all manuals, assessments and certification. The 2 day intensive course, for Physiotherapists and Qualified Exercise Instructors, costs £310 + VAT and includes all manuals, assessments and certification. LLT offer a range of discounts, see if you qualify. If you are a REPs registered instructor or hold insurance with another broker, before applying for a course with us you are advised to read the information regarding pre-requisite requirements, or contact REPS to be sure as this may impact on the validation of the insurance you hold. If you are a qualified exercise professional – your training is aligned with the exercise training framework (Skills Active/REPS). If you are a member of REPS and hold the required pre-requisites (L3 Older Adult), this course receives 16 CPD points. If you are health professional or work within health and adult social care settings – your training is aligned with Skills for Health or Skills for Care. You can apply online, but first we ask that you ensure you have read the Eligibility Guidelines and the statement about Medical Conditions and Learning Support Requirements below. You should also have read the Terms and Conditions. Course dates can be found here. If there are no courses currently in your area we will initiate a course as soon as there is enough interest but we cannot guarantee a timeframe for this. If you are interested in hosting a CBE course in your area, we do offer discounts to hosts depending on the number of applicants enrolled, just contact the LLT Office.View the Host Terms and Conditions for a CBE course host here. Having gained the LLT award most candidates need time to develop the skills and gain the experience of how to interpret the knowledge gained within their own occupational setting. Once this information has been applied and leading skills refined, many leaders seek new ideas and further challenges and maybe appropriate to progress to the Otago Leaders Award Otago Exercise Programme Leadership course. CBE Leaders interested in undertaking training on standing strength and balance exercises for frailer older people could go on to take the Otago Exercise Programme Leadership course or there is also the “Motivate Me!” one day course on how to effectively increase uptake and adherence to exercise in frailer older people. Bespoke CBE CPD days are available on request, please contact the LLT Office.